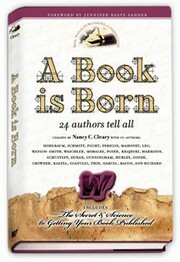 Nancy Cleary's newest release "A Book is Born: 24 Authors Tell All" takes you on a wild ride through authorhood! -- 9 out of 10 people say they have "a book in them" but what is it really like to get published? -- The EMOTIONAL, SPIRITUAL, PHYSICAL and FINANCIAL impact of publishing a book. -- How an everyday writer, who's not a celebrity, gets published. -- The 9-month birth plan every healthy book requires. -- The Secret as it applies to publishing. -- What's new, what works, what doesn't. -- The biggest self-publishing mistakes. The 4 Options for Publishing  Proportionally Open to Everyone! -- Honest info on the "Pay-for Pubs"
Copyright 2019 A Book is Born - Publishing & Author Experience Expert. All rights reserved. - View Full Version of this Press Kit.